Last Day of Freedom, nominated for the Oscar for Best Documentary Short, is a genre-buster. Its voice-over narration by Bill Babbett tells a shattering tale of his brother Manny that's especially relevant at this moment of the "Black Lives Matter" movement. It's also presented in an unusual form for such material -- a hand drawn, partly rotoscoped animation. It's in black and white, recalling the monochromatic Waltz with Bashir, Ari Folman's 2008 Oscar-nominated Israeli animated feature about war vets' troubled memories (I reviewed it as part of the 2008 New York Film Festival). I didn't get to screen the other documentary short Oscar nominees for review, but this one is being offered for prior screening by critics and is also currently available to all Netflix subscribers in toto, so I am going to review it separately here. My brief reviews of the Oscar-nominated animated and live action shorts were published here earlier. Like some of the other documentary shorts, according to reports, this one fills one with sorrow and rage. The interview/narration by Bill Babbitt about the life and death of his brother Manny is another clear picture of how a young, poor African-American male can be ground up in the system, and is in double jeopardy with special mental problems as a war veteran unable to get proper medical care. How he wound up in the Marines in Vietnam on several tours and then was executed, incredibly, after serving seventeen years in prison for murder, from 1982 to 1999, is a sad story of public misdirection and inattention, and of blind institutional cruelty. It's explained in supplementary text that Manny and Bill's family had a history of mental illness, another extenuating circumstance, along with his military history, that was not presented at his trial, at which, we also learn after Bill's narrative, the lawyer was often drunk and has admitted completely botching the capital punishment phase of the trial. When he was young, Manny was in a car accident after which he was no longer capable of performing satisfactorily at school, failing four grades; he was brain damaged. Somehow after they were grown up, when Bill was elsewhere, to his shock he learned from their mother that Manny had joined the Marines and been sent to Vietnam. He served two tours there. He had not been able to pass the Marine written test: the recruiters filled in his answers to get him in. When he came back from combat, he had PTSD, but it remained undiagnosed and untreated. He would up homeless in Providence, Rhode Island, then came out to be with his brother Bill, Bill's wife, and their three children in California. They took him in to care for him. He was diagnosed as paranoid schizophrenic. In Bill's care, Manny still went astray, and in one of the episodes when he imagined he was back in combat, he killed an old woman in her house. When Bill discovered this, he and his wife became afraid, and they turned him over to the police. They thought he would be treated with clemency, but for political reasons, it became a death penalty case. A mentally damaged man suffering from PTSD was put to death for an act committed in a state of confusion. It was a terrible act, but imagine the sadness of this story. And the pain and guilt Bill Babbitt carries with him, which we experience as he nears the end of his account. All this is entirely in Bill Babbitt's narrative. In his own words, Bill sounds uneducated, but is an articulate, succinct storyteller. He often uses precise words that show he is an intelligent man. 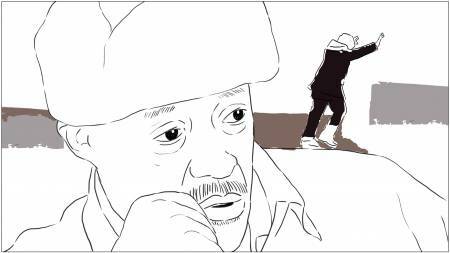 The drawings go back and forth between images evoking Manny's early life, the process of his deterioration and arrest and imprisonment, and Bill's troubled face as he tells his painful tale that ends with sadness, guilt, and regret. The drawings are simple. They are not as sharp and pretty as the ones in Waltz with Bashir. But their mixture of clarity and derangement fits Bill's narrative and Manny's troubled life. The rotoscoping of Bill provides a needed measure of detachment and perhaps dignity. It also elevates the film to a higher artistic level, makes it more classic. On his last day of freedom in 1982, Manny was at home playing with Bill's kids under sheets he had arranged to simulate a tent, to their delight. Bill's wife would never go to see Manny in prison. She wanted her last memory of him to be that playing under the sheets of a man who could not deal with the civilian world -- he had come back, Bill says, to a second war at home -- but who could communicate well with children. Dee Hibbert-Jones, 52, a Brit who's a naturalized US citizen, is an Associate Professor of Art & New Media at UC Santa Cruz. She is married to Nomi Talisman, 49, her Israeli-born life and creative partner who lives with her in San Francisco (where they are raising a child) and is a freelance editor and animator. They have engaged in a number of on-the-street art projects connecting with the public in various countries. This is their first film, born out of work filming families of individuals in capital punishment cases. Their film seems to have been acquired by the increasingly omnivorous and pretty smart Netflix. Full personal details of their backgrounds and recent fame can be found in this Bay Area Reporter article. Last Day of Freedom will screen at the Roxie Theater in San Francisco Feb. 6-9, with filmmakers' Q&A following the 2:30 p.m. screening on Sat. & Sun. Info: roxie.com. Last Day of Freedom, 32 mins., rotoscoped hand-drawn animated film in black and white with voiceover narration. This Best Documentary Short Oscar nominee is innovative, artful, emotionally powerful, and politically significant and not surprisingly many critics seem consider it the favorite. Last edited by Chris Knipp; 02-04-2016 at 02:10 AM.